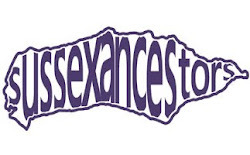 A blog for all things Sussex and Genealogical! Bastardy was a problem for every parish, partly from a moral viewpoint but largely for financial reasons. Mothers without a husband to support them and their child were likely to rely on the parish for assistance so if the parish could they would pass unmarried pregnant single women on to another parish or encourage the father of their child to marry them. There were various established procedures for handling the problem of illegitimacy. A study of baptisms in Uckfield between 1700 and 1850 finds nearly 3,000 baptisms of which only 201 were for illegitimate children - just 7%. Of those 201 the priest has recorded the fathers name in 54 cases and a further 13 children are given a middle name which is probably their fathers name so for these children it might be possible to identify their fathers. 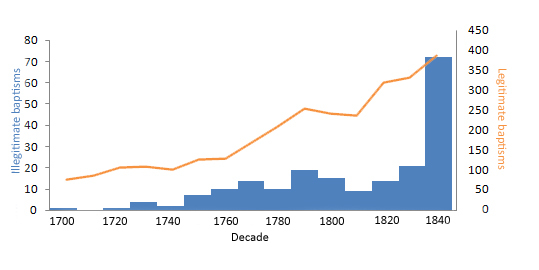 The number of illegitimate births is not evenly spread over the 150 years, there was just one illegitimate child baptised in the first decade of the 18th century and none in the second but this figure rose over the years with nearly 40% of the illegitimate births occurring between 1840 and 1850. This doesn't mean that illegitimacy was on the increase, as the graph below shows the birth rate was also increasing sharply. Where paperwork has survived there can be more information about the parents and the illegitimate child. In the case of Mary Smith two examination documents survive, one taken when she was pregnant and the other after the birth of her child. From these and other sources it is possible to determine what happened to Mary and her daughter baptised in 1767. At the age of 17 years Mary Smith was meeting the appropriately named John Brown for assignations in Shermanreed Wood near Uckfield; not surprisingly she soon found herself pregnant and deserted. Nothing is mentioned of what happened to John Brown but by the 9th February 1767 (the date of the second examination) he was a huckster 'late of the parish of Uckfield'. It is possible that his name wasn't John Brown as when his daughter was baptised on the 25th January 1767 at Holy Cross in Uckfield she was named Mary Barham Smith. Mary Smith (senior) had been baptised on the 21st May 1749 in Uckfield, the fourth child born to Richard Smith and Sarah (nee Marten). She went on to marry John Weaver in 1769 when Mary was a few years old and they had two children, Lucy baptised in 1769 (five months after their marriage) and John baptised in 1770, both in nearby Isfield. Mary died in 1789 and her husband John in 1821, both are buried in Isfield. Mary's daughter Mary Barham went on to have an illegitimate child herself, William Barham Smith, who was baptised in Uckfield on the 28th October 1787 before she married John Funnel just over a year later, on the 1st December 1788. It appears that John and Mary had a large family baptised in the parishes of Maresfield and Fletching.